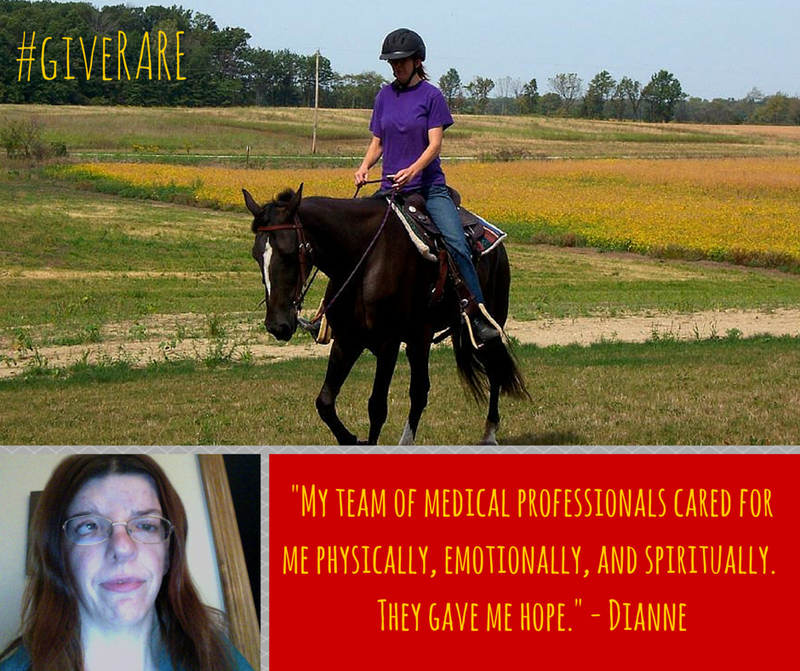 This week, leading up to #giveRARE Day on March 3, we are featuring stories of folks living with a rare disease. Today's story is from Dianne Woehnker. but are creating a strong community together. I was born in 1982, and at that time, few doctors had heard of CFND (Craniofrontonasal dysplasia). The doctors in our hometown referred us to Riley Hospital for Children, in Indianapolis, IN. I was the only patient there at the time with CFND, so my case was extensively documented by the doctors so they could use it to further study CFND and develop appropriate treatment options. Throughout my childhood and adolescence, I had a total of 13 major reconstructive surgeries on my face and head. Often when I tell people this, they say they can't imagine how a child could go through this much trauma. What they don't know is the dedicated team of medical professionals cared for me physically, emotionally, and spiritually. They treated me like family, and they gave me hope for a normal life. I am not limited in any way from living an independent lifestyle. The hospital is where I had shelter from the unkind words of kids and adults that I experienced in my life. I learned that I am not defined by my CNFD. In today's world, anyone who looks different is often treated with less respect than people without a facial difference. I want to encourage others with facial differences, that you can have a normal life. There are a lot of beautiful people who have facial differences! I have been sharing my story with others in my community in the hopes of teaching them that true beauty lies from within.